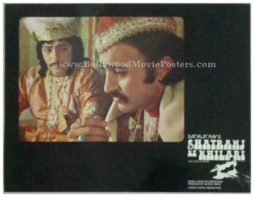 Set of twelve old Bollywood movie lobby cards of the Hindi film Bairaag (1976) for sale. 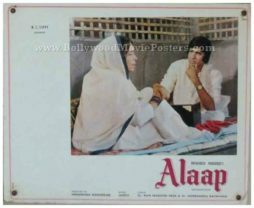 This is an actual surviving set of old Bollywood lobby cards of the 1976 Hindi film that starred the ultimate method actor of Indian cinema, Dilip Kumar in a triple role. 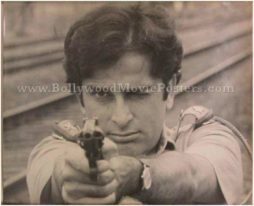 Dilip Kumar received a Best Actor Filmfare nomination for his power packed triple role in Bairaag. 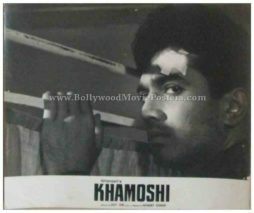 It was Dilip Kumar’s last film as hero, post which he took a five year sabbatical from films returning only to play mature character roles thereafter. 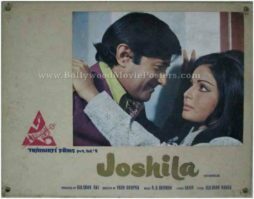 Printed and circulated somewhere in the mid 1970s, this old Indian movie lobby card set was designed and printed for publicity of the film inside a cinema hall. 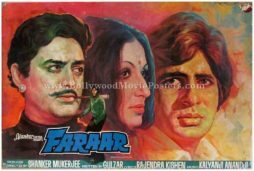 These beautiful old Bollywood movie stills were intended to be used inside a theater that screened Bairaag. Designed by taking key movie stills i.e. 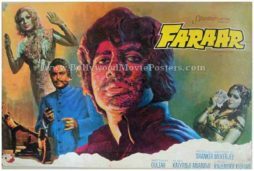 pictures and photographs from the film (shot on set location) and mounting them on a board, this lobby card set of the old Hindi film Bairaag is a rare surviving piece of Indian cinematic history! Twelve key scenes from the film are captured in this set comprising twelve individual old Bollywood movie stills. 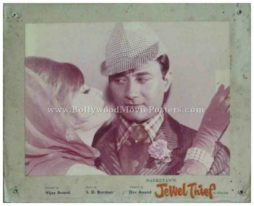 Set of ten old Bollywood movie still photos of the hit Hindi film, Baiju Bawra (1952) for sale. 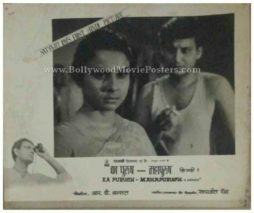 This is an actual surviving set of old Bollywood lobby cards of the 1952 Hindi film that starred Bharat Bhushan in the lead role as “Baiju” and Meena Kumari as his love interest. Meena Kumari went on to win her first Filmfare Best Actress Award in 1954 for Baiju Bawra. Coincidentally, the category for Best Actress was introduced by the Filmfare Awards Committee for the first time during the same year (1954). As such, Baiju Bawra marked not just the first Filmfare Best Actress Award of Meena Kumari’s career (she would subsequently go on to win three more Best Actress trophies in her career), but also the first Filmfare Best Actress Award ever declared. 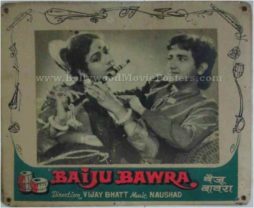 Baiju Bawra was a musical masterpiece. 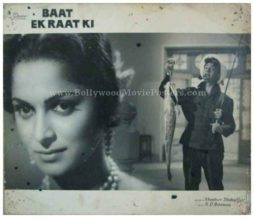 The film’s music director Naushad bagged his first and the only Filmfare Award win of his illustrious career for Baiju Bawra, making this old Bollywood still photo set highly collectible. 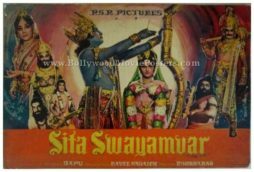 Printed and circulated somewhere in the early 1950s, this old Bollywood movie lobby card set was designed and printed for publicity of the film inside a cinema hall. These beautiful black and white Bollywood still photos were actually used inside a theater that screened Baiju Bawra. The four corners of the lobby cards feature punched holes and display tell tale sings of being pinned on the notice board of a movie theater. 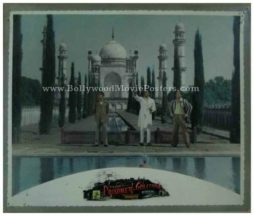 This old Bollywood movie lobby card was designed by taking an iconic still photograph from the film (shot on set location) and mounting it on a board. Ten key scenes from the film are captured in this set comprising ten individual old Bollywood movie still photos. 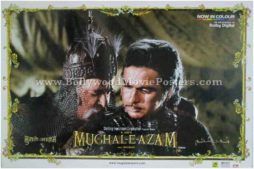 The film was based on the life of Baiju Bawra with a historic setting in Mughal Emperor Akbar’s court in India. Since it was based on classical music, the film was met with great skepticism initially but went on to become a huge commercial and critical success, catapulting both its lead actors into stardom. 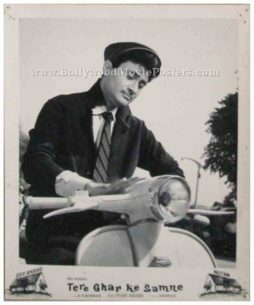 Set of two old Bollywood movie still photos of the hit Raj Kapoor film, Chori Chori (1956) for sale. 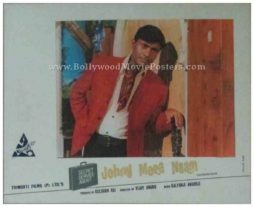 This is an actual surviving set of old Bollywood lobby cards of the 1956 Hindi film that featured the Showman of Indian cinema, Raj Kapoor in the lead role opposite Nargis. 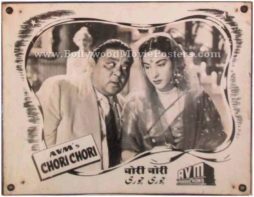 Chori Chori was the last film that featured the hit pair of Nargis and Raj Kapoor together, making this old Bollywood still photo set highly collectible. 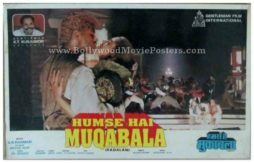 Printed and circulated somewhere in the late 1950s, this old Bollywood movie lobby card set was designed and printed for publicity of the film inside a cinema hall. These beautiful black and white Bollywood still photos were actually used inside a theater that screened Chori Chori. The four corners of the lobby cards feature punched holes and display tell tale sings of being pinned on the notice board of a movie theater. 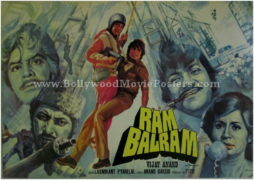 This old Bollywood movie lobby card was designed by taking an iconic still photograph from the film (shot on set location) and mounting it on a board. 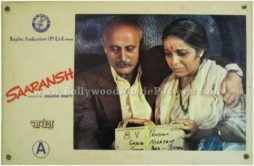 Two key scenes from the film are captured in this set of two old Bollywood movie still photos. The music of Chori Chori composed by Shankar Jaikishan was a stupendous success. Tracks like “Yeh Raat Bheegi Bheegi” sung by Lata Mangeshkar and Manna Dey are fondly remembered and played till today. 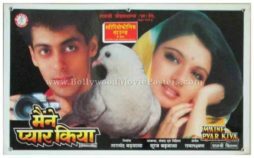 The film inspired an unofficial remake in 1991 called “Dil Hai Ke Manta Nahin” directed by Mahesh Bhatt, starring Aamir Khan and Pooja Bhatt. Old Bollywood still photos of the 1957 black and white Hindi film, Gateway of India for sale. This is an actual surviving set of old Bollywood lobby cards of the 1957 hit Hindi film that featured the “Marilyn Monroe of India,” Madhubala in the lead role. 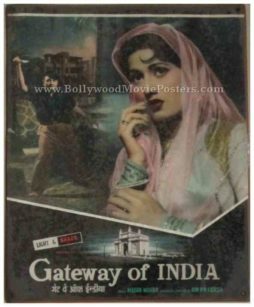 Featured here for sale is a rare surviving set of six original old Bollywood lobby cards of the Madhubala starer, Gateway of India (1957)! 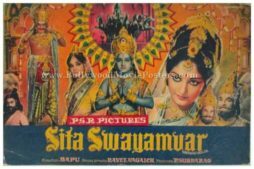 Printed and circulated during the original first release of the film (1950s), this old Bollywood picture set was printed for publicity of the film inside a cinema hall. The four corners of each lobby card have been punched with ring holes to allow cinemas to pin them up on notice boards with ease. 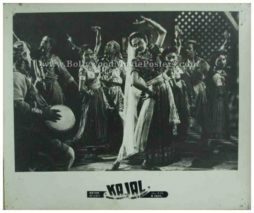 Black and white old Bollywood still photo of the Hindi film, Kajal (1948) for sale. 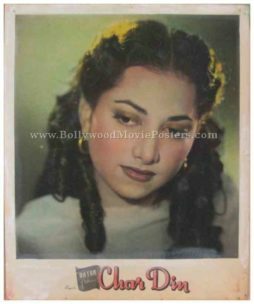 This is an actual surviving old Bollywood lobby card of the 1948 Hindi film that was produced by Ratan Pictures, starring actress Suraiya in the lead role. Bollywood actress Suraiya was also an established singer. She is remembered as the first Bollywood singer to receive the prestigious title, “Malika-e-Tarannum” (Queen of Melody). 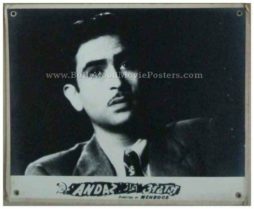 Printed and circulated during the original first release of the film (late 1940s), this old Bollywood black and white picture was printed for publicity of the film inside a cinema hall. The corners of the lobby card display visible pin hole markings – tell tale signs of being pinned on the notice board of a movie theater. 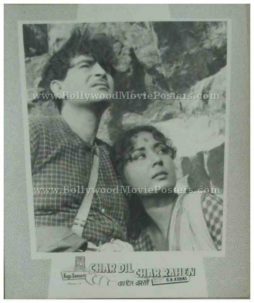 Old Bollywood still photo of the Hindi film, Char Din (1949) for sale. This is an actual surviving old Bollywood lobby card of the 1949 Hindi film that was produced by Ratan Pictures, starring actress Suraiya in the lead role. 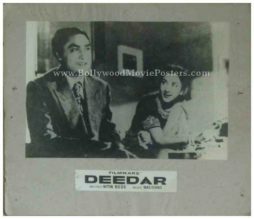 Printed and circulated during the original first release of the film (late 1940s), this old Bollywood picture was printed for publicity of the film inside a cinema hall. The corners of the lobby card display visible pin hole markings – tell tale signs of being pinned on the notice board of a movie theater.